It’s still chilly in Vienna. When I went out to get coffee (and an hour to myself) this morning, it was about 40. Not too bad, but not yet quite springlike (especially with the nearly ever present wind). But it must be almost spring here, because when I got to Starbucks, they had set up the outdoor seating area. I was cold. By the end of my hour, I was wrapped in my coat, had pulled my wool hat on as far as it would go and struggled to turn the pages in my book with my thickly gloved hands. But it was glorious. I hadn’t realized just how much I missed getting to enjoy the center of the city with a cup of tea and a good book. My hours spent on my own will be more therapeutic and restorative now that they get to take place in the open air. I had forgotten, too, how quiet Vienna has been in the winter. It’s like the city has been hibernating since Christmas. The squares have been sparsely populated. By contrast, today was bustling — tourists with cameras bumping in to each other to get the best shot of the dome of the Spanish Riding School; bicycles flying up and down the streets, with and against traffic; horse drawn carriages, full of bundled people taking in the sights. It reminded me that this is just a fraction of the activity that will fill the square as the weather gets warmer. Being out on the square, being able to take all of this in while I relax and enjoy the city, is really why I love being able to sit outside. I feel like I’m able to see and experience so much more, and, since I’m just sitting, I’m able to quietly observe the sights, sounds, smells and feel of Vienna much more deeply. Sitting outside at Michealerplatz every week is part of what helped me fall in love with living in Vienna, and I’m so excited to have that back. 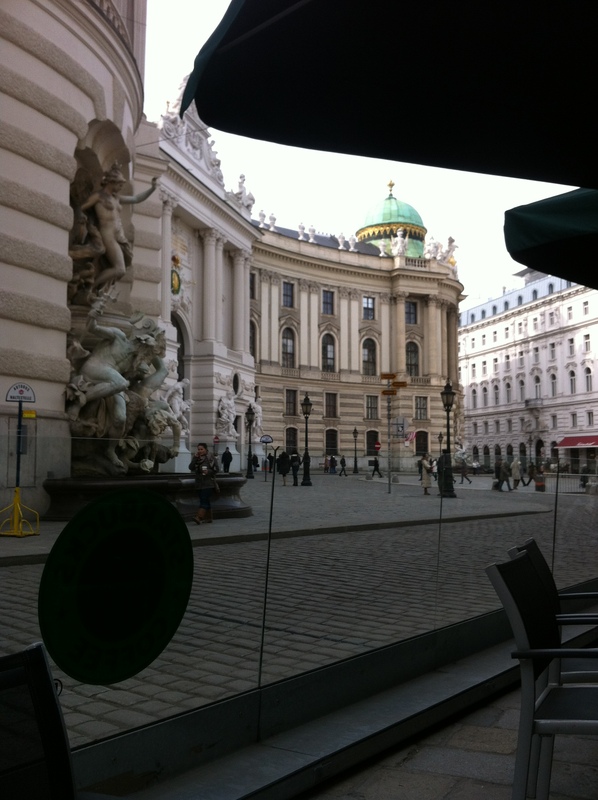 This entry was posted in Adventure in Vienna and tagged cafe, coffee, outdoors, sitting outside, spring by admin. Bookmark the permalink.